The partnership of Tiffany and Parrish had been called "one of the major artistic collaborations in early 20th Century America." 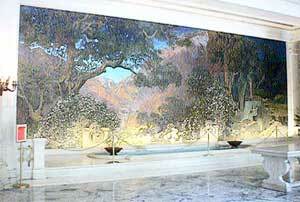 Dream Garden is an enormous glass mosaic designed by artist Maxfield Parrish (1870-1966), and executed by Louis Comfort Tiffany and Tiffany Studios, for the lobby of the Curtis Publishing Building in Philadelphia — home of the successful magazines The Ladies' Home Journal and The Saturday Evening Post. The work was commissioned by Edward Bok, Senior Editor of the Curtis Publishing Company. Over a one-month period, prior to being installed in the Curtis Building, the work was exhibited at Tiffany Studios in New York City, attracting more than 7,000 admirers and garnering widespread critical acclaim. The Dream Garden took six months to install into its home in Philadelphia. Multi-talented Maxfield Parrish was known as a "master of make-believe," charming readers with illustrations for children's books and magazine covers. Parrish's method of alternating transparent oil paints with varnish added the illusion of light to his landscapes. Measuring 15 by 49 feet, Dream Garden was produced by the Tiffany Studios in 1916, using over 100,000 pieces of favrile glass, each hand-fired to achieve perfection in each of the 260 colors. The partnership of Tiffany and Parrish had been called "one of the major artistic collaborations in early 20th Century America." In truth, the relationship between Maxfield Parrish and Louis Comfort Tiffany was tumultuous, based on a rueful assessment of each other's artistic merit. While Parrish complained that Tiffany's translation of his design lacked subtlety and "painterliness," Tiffany countered that the design sketches were technically vague. In June of 1998, Dream Garden was sold to casino owner Steve Wynn, who planned to move it to Las Vegas. Philadelphia historians, artists, activitists (notably the Arts Defense League), and press protested the proposed move — and the Pew Charitable Trusts agreed to provide $3.5 million to the Pennsylvania Academy of the Fine Arts in order to purchase the important work. The work is now owned by the Pennsylvania Academy, and is permanently installed in its rightful home in the Curtis Center lobby. In 1998 it was sold to a casino owner. 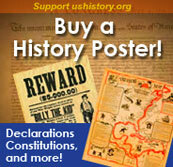 Philadelphians rallied to buy it back.